I chose this name because the shape and pattern of the bag remind me of my favourite dirndl skirt, when I was little. Any cotton or ribbon yarn can be used, as long as the tension on the label is around 20sts to 4 inches/10cm. If you use one of the bulky ribbon yarns, with a tension of 10sts to 4 inches/10cm, then halve the number of stitches and rows to get the same size bag. 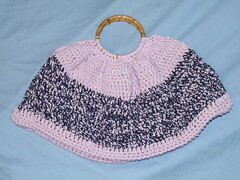 I used Pingouin Tricotine in lavender, and Sirdar Milano in navy, but both of these are discontinued. The finished size is approximately 8 inches/20cm deep by 12 inches/30cm wide. Gauge is not crucial to this project, but I worked at a gauge of 12 sts and 5 pattern rows to 4 inches/10cm. If you wish to have a more versatile bag, you may wish to line it – I left it unlined, to act as a beach bag. Working with two strands of yarn A held together, work 20dc around one of the handles. Turn. Row 1: ch3, work 2tr into every dc. Turn. Row 3: ch3, 1tr into every dc across. Turn. Row 4: ch1, 1 dc into every tr across. Turn. Work 3 more rows, alternating dc rows and tr rows. Fasten off. Repeat for second handle, but do not fasten off. Next row: Begin working with one strand of A and one strand of B. ch1, dc across the row, and then on across the last row of the first handle section. At the end of the row, sl st to the first ch to join into a round. From now on, you will be working in rounds, with one strand of A and one of B, but still alternating dc rounds with tr rounds. Next row: ch3, tr around, sl st to 3rd of commencing ch. Following row: ch1, dc around, sl sl to commencing ch. Continue with one A and one B until you have worked 10 rounds in total in those colours. Change back to two strands of A, and work a further 4 rounds. Turn the bag inside out and ss the bottom together. Working with two strands of yarn A held together, work 20sc around one of the handles. Turn. Row 1: ch3, work 2dc into every sc. Turn. Row 3: ch3, 1dc into every sc across. Turn. Row 4: ch1, 1sc into every dc across. Turn. Work 3 more rows, alternating sc rows and dc rows. Fasten off. Next row: Begin working with one strand of A and one strand of B. ch1, sc across the row, and then on across the last row of the first handle section. At the end of the row, sl st to the first ch to join into a round. From now on, you will be working in rounds, with one strand of A and one of B, but still alternating sc rounds with dc rounds. Next row: ch3, dc around, sl st to 3rd of commencing ch. Following row: ch1, sc around, sl sl to commencing ch. Ooh my Gran used to have a bag just like that!